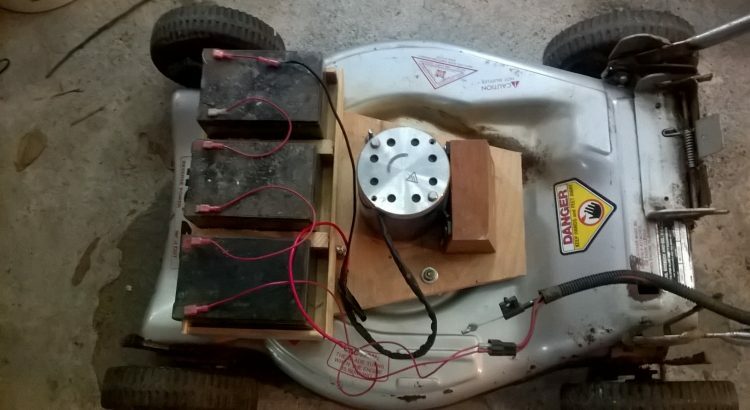 I performed a systems test a few minutes ago on the electric lawnmower I made from scratch using a gasoline power mower chassis and starter wires. The test went well, so well, so quiet I almost didn’t hear it. The next step will be testing it for how well it cuts and how long the batteries last. The batteries are at least 7 years old but were not used much. So far they seem ok.
Of course I will purchase the correct sized arbor for the 1/2″ shaft motor. I rigged up one I had used for years for my grinder mower. I concocted a sleeve to make the 5/8″ arbor work. After I am satisfied the mower works well the next phase will be powering it with 2 Ryobi One+ batteries I use for my power tools. Ryobi has a mower based on this power source.